Youths busy with decorating the village . After 70 years of Independence, finally a tiny hamlet in Dibrugarh district is set to celebrate the Christmas with electric light. The residents of Shalmari Hatigarh, a remote village in Tingkhong area in Dibrugarh district, who for the last several decades celebrated Christmas without light, is set to celebrate Christmas with light this time. Shalmari Hatigarh is 70 km from Dibrugarh. Altogether 60 Christian families have been residing in the village for last several decades. The youths of the village are very much excited and they are busy in illuminating the village with colourful lights. Some others are practising Christmas carol. 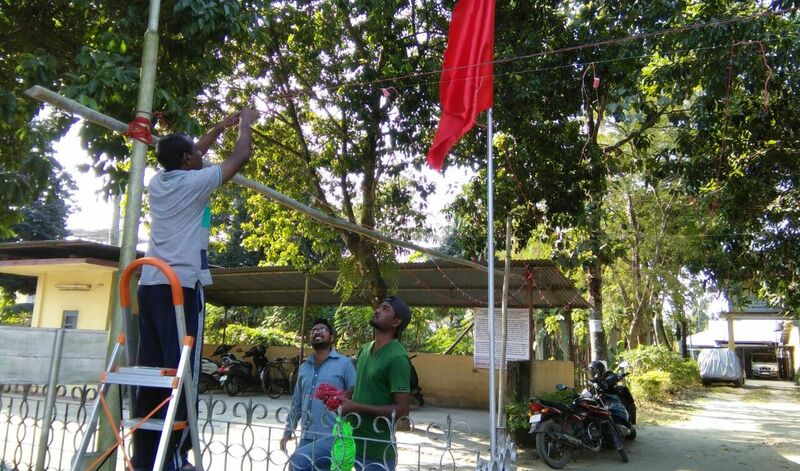 “We are very much excited with the Christmas because for the first time we will observe the festival with electric lights,” a youth of the village told Northeast Now. Light has an important role during Christmas celebration because the Christian people decorated their houses with decorative lights. The residents have decorated the village with lights, stars and illuminated Christmas trees. The village so far has produced four graduates. “We have no words to express our happiness because this time we will celebrate the Christmas with lights. Christmas is the prime festival of Christians and this year the lights will add more into our celebration. Earlier, we celebrated the Christmas without light. After 70 years of Independence our village has been electrified this year. On November 16, our village got electricity connection for the first time,” said Domnic Burh, an elderly person of the village, who have passed half of his life in the village sans electricity. Most of the residents of the village are belonging to tea garden community and were settled here before 1950. The villagers have to walk over three km to catch public transport. Road connectivity in the village is very poor and the children have to travel 12 km to go to school hence maximum of them are school dropout. “Darkness has gone from our village and it has got a new life. We believe that after so much of long struggle our village was electrified and we are going to celebrate the Christmas under the lights,” Burh said. Rufina Aind, who is the first graduate of the village, said, “The Christmas will become a historic day for us because we will celebrate the festival with lights for the first time. Finally electrification was done in our village.” She expressed hope that the development of their village will be started with the advent of electricity.